A microlight is a weight-shift controlled aircraft, consisting of a wing and an undercarriage. Having grown from the hang gliding industry the wing is similar in design to that of a modern day hang glider. From this wing the engine, landing gear, pilot and passenger are suspended in a tricycle type undercarriage. Due to this tricycle undercarriage you will often hear these aircraft simply referred to as trikes. Microlights are very stable and offer impressive performance with short takeoff and landing, exceptional climb rates, sporty handling, comfortable two-place seating, quick pack-up/set-up, portability, ease of storage, low maintenance and an affordable price tag. 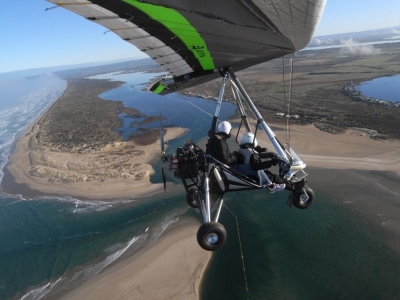 As a result microlights have become an increasingly popular form of recreational aviation. Adelaide Airsports has been involved with microlight flying since its very conception and was the first school in Australia to offer full time professional training in this form of powered flight. Indeed our Chief Flying Instructor, Larry Jones designed and built one of the first microlight aircraft to ever fly in Australia way back in the 1970’s. 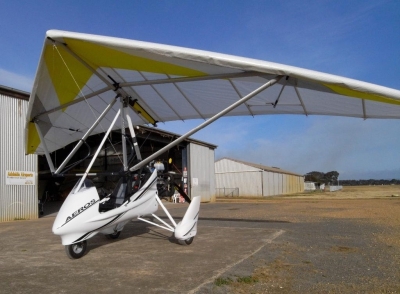 Established in 1985 Adelaide Airsports is Australia's longest running microlight school and our base at the Strathalbyn Airfield is Australia’s largest for this type of aircraft. Over 35 privately owned microlight aircraft are hangared at Strathalbyn and microlight pilots use the facilities at Strathalbyn for storing and maintaining their aircraft, for socialising and of course for regular microlight flying activity. Adelaide Airsports is a sales, service and instruction centre for microlight aircraft and all associated equipment and accessories. We sell a full range of new, used and demo aircraft and are Australia’s leading dealer for Airborne Windsports. Our instructors are some of the most experienced available having taught pilots both here and abroad. We are qualified to take you from your first trial flight right through to instructor level and beyond if you so desire. To learn a little more about our activities and to experience firsthand the thrill of flight we offer a Trial Instructional Flight in our two-seat microlights. This flight is your first step towards a fun filled world of flight! See the picture gallery for more images of microlights.